Lego is a fantastic toy. I loved it as a child and I love it still. I love how it encourages imaginative play and fosters independence by letting children create their own games or follow instructions alone if they wish. We have a vast amount of Lego! I had lots from when I was a child and then as soon as my children were old enough, I have bought lots and lots more. Storage was a problem though. I’d tried all sorts. Boxes, tubs, an old sideboard, chest of drawers, toy chest etc. Then I had a lightbulb moment. They don’t WANT to put it away, out of sight. These are their previous creations. But… I don’t want the playroom floor to be a perpetual sea of Lego. I bought a large, white Kallax unit with two drawer inserts and two cupboard inserts. It’s currently partially assembled (still need to put the cupboard inserts in) but the children have already filled it with some of their Lego. 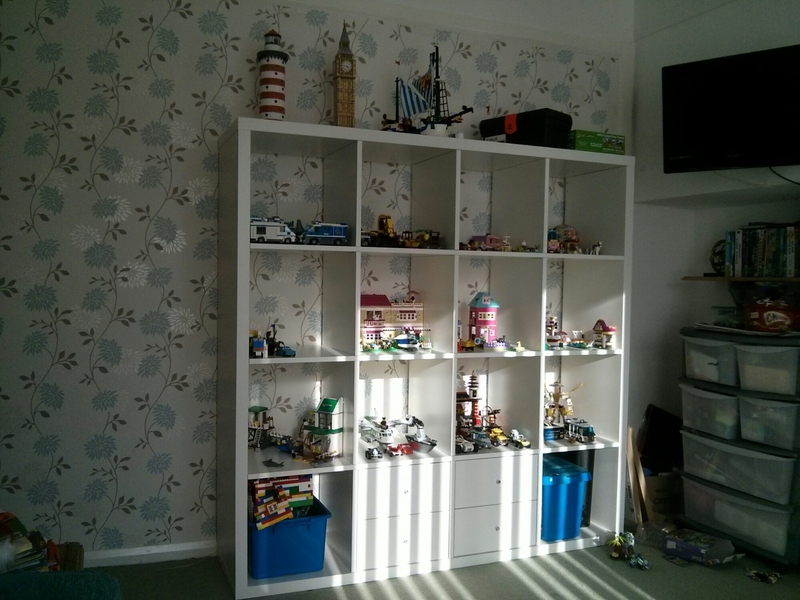 I’m thrilled with it, and am now naturally itching to sort out the rest of the playroom! The children are delighted too. They can set up little scenes on each shelf, easily see what they have and reach everything themselves. Previous PostMoney MattersNext PostOne of those evenings..